Join Us!!! We are looking for someone to help us cover South American Championships U17 basketball. Please send us an e-mail. Argentina marched past Colombia to clinch the Gold medals in Sucre. Florencia Chagas (174-G-01) posted 20 points, 7 rebounds and 6 assists for the champions. Argentina secured a 31:25 halftime advantage. They extended the margin at 15-point mark heading into the fourth period. Argentina limited their opponents to just 12 points in the final quarter and rallied to the triumph. 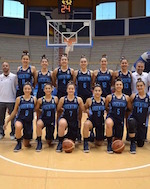 Sofia Acevedo (167-PG-01) dropped 22 points for the winners. Maria Zamora (170-SF-00) responded with 18 points for Colombia. Chile stepped onto the pedestal in Sucre. They overcame Venezuela in the Bronze medals game. Gallardo Ana (163-PG-00) posted 19 points and 9 rebounds for the winners. Chile dominated in the first half. They accumulated a 37:23 halftime lead. Venezuela sank 24 points in the fourth term to cut the deficit but could not avoid the loss. Priscila Godoy (169-PG-00) accounted for 15 points in the victory. Odeth Betancourt (183-C-00) responded with 19 points and 14 rebounds for Venezuela. Ecuador finished fifth at the championship. They coasted past Peru on the final day of action. Vanessa Ochoa (167-PG-01) stepped up with 13 points to lead the charge. Ecuador piled up a 38:23 halftime lead. They followed with a 47:17 run in the second half to seal a comfortable win. Lory Lugo (183-F/C-00) delivered 12 points and 11 rebounds for the winners. Veronica Escudero (173-SF-01) responded with 14 points for Peru. Bolivia finally secured the first victory at the home championship. They nipped Uruguay to occupy the seventh position at the tournament. Noelia Tapia (157-SG-01) recorded 15 points to pace the hosts. Bolivia grabbed a 29:19 halftime advantage. Uruguay narrowed the gap in the second half but came up short of victory at the end. Liz Carrasco (168-PF-00) tossed in 14 points and grabbed 13 rebounds in the win. Aldana Gayoso (168-PG-00) responded with 24 points for Uruguay. Argentina topped Venezuela to secure the championship game birth. Sofia Acevedo (167-PG-01) dropped 20 points to lead the effort. Argentina ensured a 31:21 halftime advantage. Venezuela pulled within 9 points at the final intermission. However Argentina banked in 43 points in the fourth period to ice the win. 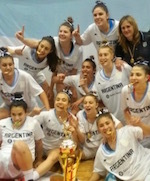 Camila Suarez (PG) had 18 points and 9 boards for the winners. Yulianny Perez (175-F-01) responded with 23 points for Venezuela. Colombia coasted past Chile to advance into the title game in Sucre. Sara Pardo (169-SF-00) stepped up with 16 points to pace the winners. Colombia limited their opponents to just 8 points in the first half to open a comfortable 47:8 halftime lead. They followed with a 17:10 run in the third term to clear off for good. Naylee Cortes (174-PF-03) accounted for 10 points for the winning side. Jovanka Ljubetic (170-PG-00) answered with 10 points for Chile.